I practice the full spectrum of family medicine including the treatment of children and elderly patients. I place an emphasis on preventative healthcare and chronic disease management. Some of these chronic diseases include conditions such as diabetes, hypertension, asthma and heart failure. I also work as an educator for medical students and family medicine residents. I strive to provide patient-centered and cost-effective care that is based on the best research evidence available. I believe in individualized healthcare and that a patient’s health can be improved through patient education, partnership and shared decision-making. I love working at The Ohio State University because we are continually expanding our patient-centered care. The knowledge base and resources here at Ohio State are unmatched by any other institution. In addition, I find it stimulating to have the opportunity to teach students and residents. In my free time I enjoy relaxing with my family, traveling and enjoying the outdoors. My PCP is always concerned and caring when I see him or contact him via OSUMyChart. He is always responsive. The best - wish everyone could experience this high degree of healthcare. Dr. McConnaghy has been my physician for many years; he is extremely good, very personable and friendly, and has helped me many times with medical issues. I trust him completely. Dr. Mac is very thorough and respectful. Has a genuine concern for my well being. 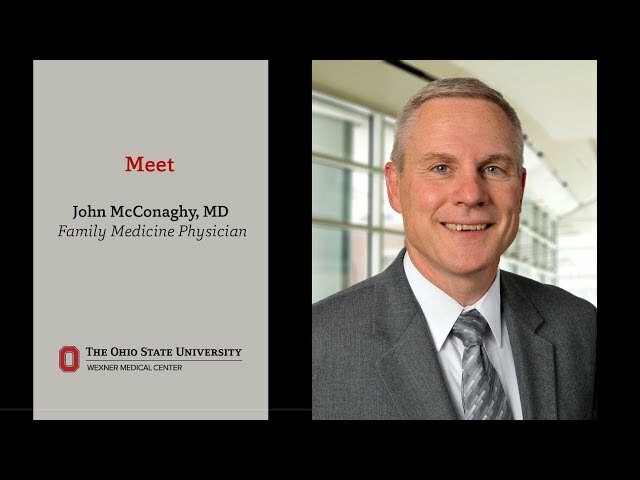 As of 12/20/2018, Dr. McConaghy has reported no relationships with companies or entities.